It's odd. Considering it's primarily built upon the nostalgia of grown fans of the series, the reluctance to embrace the source material feels a bit baffling. Sure, the right things get name-dropped, but, for the most part, it feels like something that wants to be its own thing, trapped by within the constraints of an iconic brand. This is best exemplified in the reluctance to play the iconic theme, more willing to playing an overused Kanye West song. One's not asking for it to play wherever possible, but it's hardly asking a lot that, in a film named Power Rangers, the iconic theme at least finishes the chorus. On pre-historic Earth, a group of Power Rangers are tasked with protecting life on Earth, along with the Zeo Crystal. Betrayed by their Green Ranger, Rita Repulsa (Elizabeth Banks), their power source is hidden by the Red Ranger, Zordon (Bryan Cranston). 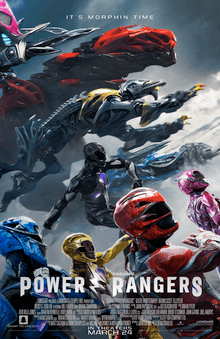 In the modern day, five teenagers (Dacre Montgomery, Naomi Scott, Rj Cyler, Becky G, Ludi Lin) stumble upon an ancient spaceship, where Zordon's consciousness has been transferred to. He informs them that they've been chosen to become Power Rangers, and must stop the return of Rita. A picture like this can live or die, depending on its core group. Bring together a number of charisma free actors, and one will struggle to care for them, which makes it a relief how easy it is to get behind them. RJ Cyler is the lovable standout, bringing effortless charm to the role of Billy Cranston. On the flip side, Dacre Montgomery only reaches the heights of "passable", which isn't good for the group leader. But, the group work well off one another, making their bond entirely believable and selling their team dynamic. In the supporting roles, Bryan Cranston does well as the grumpy guide to the Power Rangers, while Bill Hader does fun work as Alpha 5. In portraying the villainous Rita Repulsa, Elizabeth Banks is clearly having a ball, devouring the scenery as gleefully as her character devours gold. But it's all a bit too cartoonish, more in line with Mighty Morphin Power Rangers: The Movie, but with a higher probability of a homeless person getting murdered. John Gatins' screenplay chooses to focus on character for the first two acts, with the action not of importance until the finale. It's a good way to approach the material, allowing for viewers to understand the characters, as well as sympathise with their individual troubles, and their own methods of coping with them. It's a good thing to update the characters, so they can reflect the modern world with relatable struggles. Part of this is shown in how diverse the team have become, with Trini implied to be queer, and Billy being on the spectrum. But the way much of this is approached doesn't work so well, feeling too out of place. Including a sexting scandal is a relevant idea to touch upon, but doesn't fit in so well here, while the opening gag about someone masturbating a bull would've been better cut out. It's jarring how certain revelations only come to light when it's most convenient, or some are never given a proper explanation. This feels like lazy storytelling method, much like how the growing rift between Jason and his dad never finds a natural conclusion, but then it's never expanded upon the initial idea. But the worst element has to be the forced product placement, which makes a plot device out of Krispy Kreme. As is the standard, these characters have received a cinematic redesign, but one questions whether the result had to look so ugly. There's nothing wrong with the film setting its own visual look, but from the costumes to the Zords, and especially the villains, it's all garishly designed, brought to screen by some pretty noticeable CGI. It may look a tad dated and somewhat goofy, but one almost wishes the original look of the TV series was retained. Considering how the cinematic adaptations of Transformers, G.I. Joe and Teenage Mutant Ninja Turtles turned out, the best compliment to give Power Rangers is that it could have been worse. It doesn't all work, the designs are eye sores, the script could've used a touch up, and the source material could have been embraced more, but a knowing sense of fun and a likeable core group help keep ones attention.